How cute is the little star that i've popped on it? I got this idea from the October Afternoon blog this week and i've been dying to try it! 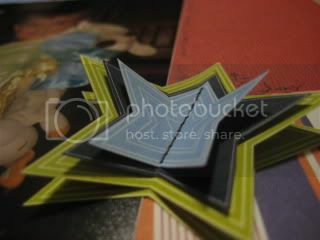 It's just like when you pop up a butterfly's wings, but with stars - such a simple, yet effective idea! Loving it!!! 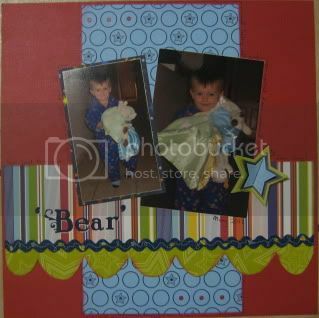 The PP i've used is a mix of some old American Crafts papers and the lovely Blast Off range from Bo Bunny. I've been SOOOO into this range - you've probably seen it feature a lot on my blog recently! I can't believe how much i love it - it suits my little boy so well since he's so into space stuff :D October Afternoon has just realeased a space range too - that makes 3 in total - one from Bo Bunny, another from Fancy Pants and the third from October Afternoon. It seems everyone is jumping on the 'space' bandwagon this year - and i'm loving it!!! Well, i'm off to bed now. Got to get a good night sleep before i head over to Somewhere to Scrap tomorrow for their monthly marathon day/night crop. I went to this last month and it was awesome! It goes from 9am to midnight. I only go from about 1pm because i like to spend the morning with the fam. We're going to take Calvin down to a new park in our area tomorrow with his tricycle - he'll have a ball!! Don't forget to head over to Scrapboutique to join in the fun with their monthly CC!! There is lots of inspiration flowing and even a few prizes up for grabs!! !